When I talk about authors who write musically, Catherine M. Wilson is one of those authors. After reading her The Warrior’s Path right after reading the Frey Saga I found myself understanding a profound musical difference between authors. The Warrior’s Path is written in a minor key (or moll in Norwegian) while the Frey Saga is written in a major key (dur in Norwegian). How cool is that?? Our hero, Tamras, learns a great deal about herself, her prejudices and her talents during The Warrior’s Path. Some of these talents point to a mystical ability that may or may not become more apparent as the trilogy advances. One of her most important lessons is taught by her Warrior, Maara. Maara teaches her that Tamras is not her emotions but that she has the ability to decide how to use them. Tamras learns to deal with disappointment, anger, jealousy and fear. I often think that we are what we choose. Just think of the many times you might have thought “if only”. Many of my choices have been less than ideal. 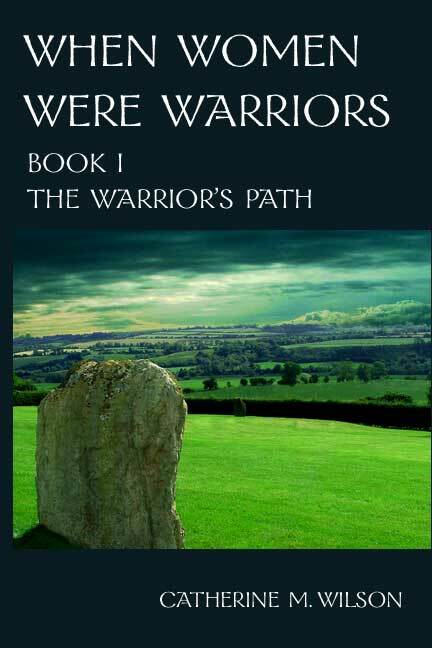 But choosing to read The Warrior’s Path is a choice that has given me new insight and great pleasure. To think that this is Catherine M. Wilson’s first novel says quite a bit about her talent for the craft and her ability to develop it. I know she doubts she will write any more novels after spending ten years on her trilogy. That would be a pity. After researching a bit more about the novel on the net I realized it falls within the lesbian/gay category as well as any other. Never entered my mind while reading it. To me it was just fantasy – really good fantasy – with a semi-lesbian twist. Didn’t seem all that important to me. But it is on the must read list of several lesbian/gay sites out there, soooo?